There is always confusion over the two (actually three) types of LS3/5 and LS3/5a and the crossovers that should be considered for each version. The original version was LS3/5, using crossover FL6/16 from 1970. This used the KEF B110 A6362, the original B110 4-8 ohm version (nominal 6 ohms), and the original KEF T27 A6340 with a clear mylar dome and black plastic case. The original network was a standard 4th order configuration for the L.F. section, but this was not right and changes were made on 9th October 1970, when the circuit topology was changed to be similar to that on the FL 6/23. The values were of course different as the B110 impedance and unit parameters were different. There were only about 20 of these made, and never produced commercially. However if anyone has these units and wants a crossover then we can supply a ferrite version with a tapped H.F. ferrite inductor and matching input capacitors. 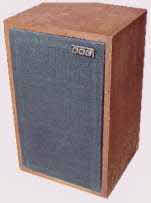 The first LS3/5a production crossover was the FL6/23 from 1974 and this went through various modifications over the years, due to variations in the KEF units. This crossover is available from us and is used in our current production 15 ohm BBC Licenced LS3/5a. The variations were caused by various things including changes in the Bextrene supplied. This plastic was bought by KEF ½ a ton at a time, but when they protested about the changes - usually not notified - they were told they were a very small user. The car industry was then using tons per week as acoustic dampening. The problem was not helped by the original selection of the reference unit by the BBC. About 24 units were tested and instead of an ‘average’ unit being selected, one of the flatter response units on te edge of production specification was chosen. Hence there was always a reject problem. Subsequent changes in the network had to be made to correct for the changes in production materials etc. as there was no variation in final output specification permitted. C5 from 6.2mFd to 8.3mFd to 10mFd. R2 from 33 Ohm to 22 Ohm. The tweeter input capacitors C2 were increased over time by about 10% to compensate for a tendency of the T27 to have a rising response. This was spotted in the early 80’s when Goodmans took on one of the licences (from RAM, who had gone into liquidation. There were and still are only 3 no. BBC LS3/5a licencees at a time.). The capacitor increases increased the output in the 5-8kHz. range. Variations were notified in 1980 and 1984. This is why we ask you the dates for your drivers when you purchase LS3/5a crossovers. Falcon applied in January 1982 for a licence to manufacture the LS3/5A, (we had a subsidiary company, Nightingale Acoustics Ltd.) but lost out to Goodmans. A comment by the BBC Designs Department on validating the sample systems supplied by Goodmans using our manufactured crossovers, was "All capacitors bridged and found to be very close tolerance. It was noted that these components were probably individually selected so that the crossover was therefore not typical." We were a little upset, as this was a standard crossover. All we had done, as with all our polyester capacitors was to select them all out into 5% batches. Many of the capacitors were made up from 2 capacitors in parallel, so we put a 0-5% and a 0+5% in parallel to give a cancelling tolerance variation. Other values, such as C4, 5.03mFd. is specified as 4.7 + 0.33mFd. We used a 4.7mFd selected to +5 to +10% an overall variation of only .235mFd, this was an outside variation as due to production spreads, there were less values at the +10% than the +5% (Gaussian distribution). There was quiet satisfaction when Falcon was granted a BBC LS3/5a Licence in 2013! Crossovers are available as the full spec FL6/23 version as used in the Falcon Acoustics production LS3/5a with transformer type inductors and H.F. tapped transformer. Also available is the No. 23 ferrite version with resistive H.F. attenuation, the No. 23T which is the same but with a tapped H.F. inductor and matching input capacitors. The 23aB version is a Falcon modification using the aB H.F. circuit and has been said by many to be the best version. All 23 type networks are on Falcon No.7 PCB. Component Kit version (No. 102/ID/T) is also available using Iron Dust Inductors and Polypropylene caps with an Iron Dust auto tapped HF inductor. This gives xover power handling well in excess of the units, to keep the distortion in transients as low as possible and the Polypropylene capacitors give very low losses at high frequencies. As the B110 response changed during its production span there were changes in the crossover to compensate. These are tabled below. It may be preferable, if the date of unit manufacture is known, to substitute the original values. Obviously the crossover changes came in after the 'unit' changes. The last 11 ohm LS3/5A uses the different KEF B110 SP1228 6 ohm drive units and crossovers (FL6/38). These are not interchangeable with 15 ohm version components. It has become common to use the 15 Ohm and 11 Ohm versions to describe the different types. This is not particularly helpful as the impedance curve (fig. 3) below will show. What impedance you classify this system is anyone guess! It is best to specify the units or the Spec. i.e. FL6/23 etc. We can supply a component set for the new version of the crossover FL6/38, using the B110C - SP1228, with full size hard wire layout. Supplied with iron-dust core/ferrite inductors and polypropylene capacitors. These inductors are of higher power rating than the official KEF versions. Superior distortion/power handling and lower loss/dielectric distortion in the capacitors. Falcon No.101 Versions. Also available as No. 101/ID/T with a 3 tap HF inductor and matching caps. All are ideal for use as an external bi-wired crossover. Original FL6/16 from 1970 and used the B110 A6362, the original 4-8 ohm version, and T27 A6340 with the black plastic case. No. 100T, with a tapped H.F. ferrite inductor and matching input capacitors. No. 23. A ferrite version with resistive H.F. attenuation. No. 23T. The same but with a tapped H.F. inductor and tap matching input capacitors. No. 23aB. A Falcon design with the same LF Section but using the aB* H.F. circuit for teh HF Section, said by many to be the best. All 23 series networks are on Falcon PCB No.7. * aB is the acoustic Butterworth circuit originally devised for the T27 in the 104aB system. It gives a true 18dB acoustic roll-off and suppresses the rise due to the tweeter resonance. It is used in most of the KEF designs. No. 102/ID/T. A component Kit version using Iron Dust Inductors and Polypropylene caps with an Iron Dust auto tapped HF inductor. Components only. No. 101 Series Falcon component sets. Iron Dust Inductors, Polypropylene caps (Solen or ClarityCaps) and BBC designed resistive 'T' section HF attenuation. No. 101/ID/T As 101 Seriesbut with a 3 tap HF inductor and Tap matching caps. Both ideal for use as an external bi-wired crossover.